Posted on February 16, 2018 at 1:21 am. 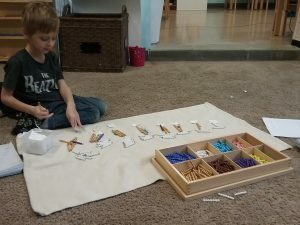 As a parent of a Montessori child, you might be surprised by the amount of independence and self-regulation we require of such young children. We ask your child to remember their own homework and supplies, to manage their own time and meet deadlines, to answer their own questions, to come up with solutions when they have dropped the ball, among many other things. I often wonder what age it was that I finally learned how I learn best, how to find the information I was seeking, and how to be productive on my busiest of days. It may not have been until college that I really had a grasp on all of these things. How lucky these students are to be constantly working towards mastering these skills at such a young age! 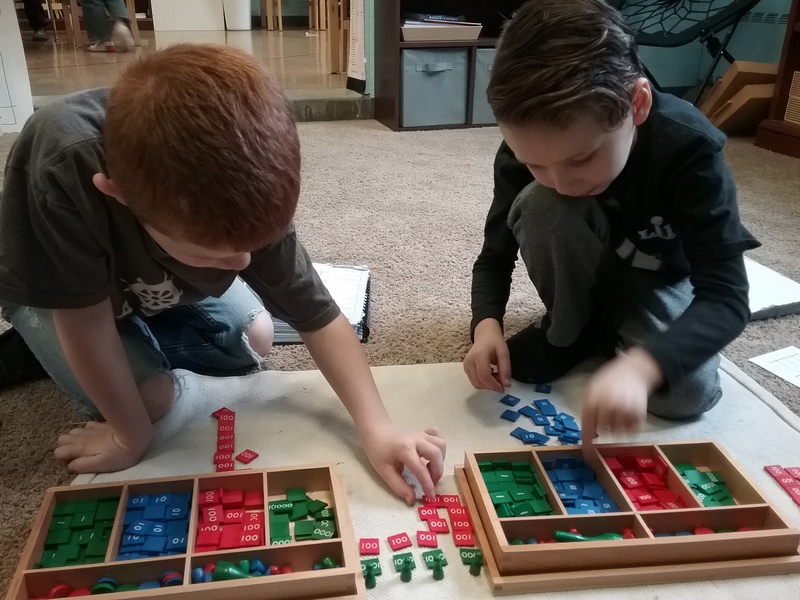 Think of how much they will be able to accomplish in the future, with ease, because of the Montessori environment! 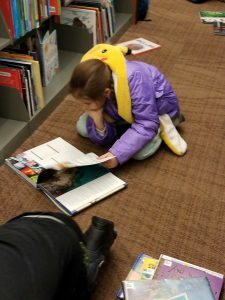 When your child is struggling with the challenges that arise in the Elementary classroom, remember that independence they are working towards, be that listening ear and that constant reminder that they just might not be able to do it YET, but with hard work, their struggle with one specific task or challenge will be temporary. This Monday we took a trip to the Tallmadge Library to collect books in preparation of the Science Fair. Students are researching questions they have come up with about plants, robots, electricity, gases, and animals. Students were required to search the books, not just for the overall topic, but to be sure it would be helpful in answering their question. Each child has started their research in order to come up with a hypothesis before experimentation. The third year students have been working with the Pythagorean Theorem. Previously, they found that the formula worked with isosceles triangles. This week, they tried the formula with a scalene triangle, then found Pythagorean Triples! All students have partnered up this month to complete a study of a country in Europe. This first year student is researching the homes in Russia. After completing their research, students will write a research paper and present their findings to the class. 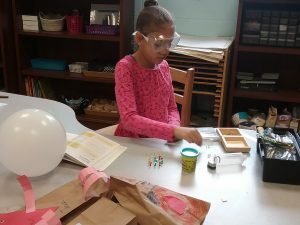 This second year student is researching what would happen if she placed a balloon on one thumbtack, then placed a second balloon on a large amount of thumbtacks. She discovered that the weight is evenly distributed with the pile of thumbtacks and her balloon did not pop! This month, students are trying experiments that show how the human body works. This week, they had a taste test. The children had to cover their eyes and plug their nose while they tried an apple and an onion. They then discussed whether sight and smell make a difference in taste! Next week, we have our first “Going Out Experience” to the Greater Cleveland Aquarium on Tuesday. If you are driving other students, please arrive by 8:45. If you are meeting us at the Aquarium, please let me know. 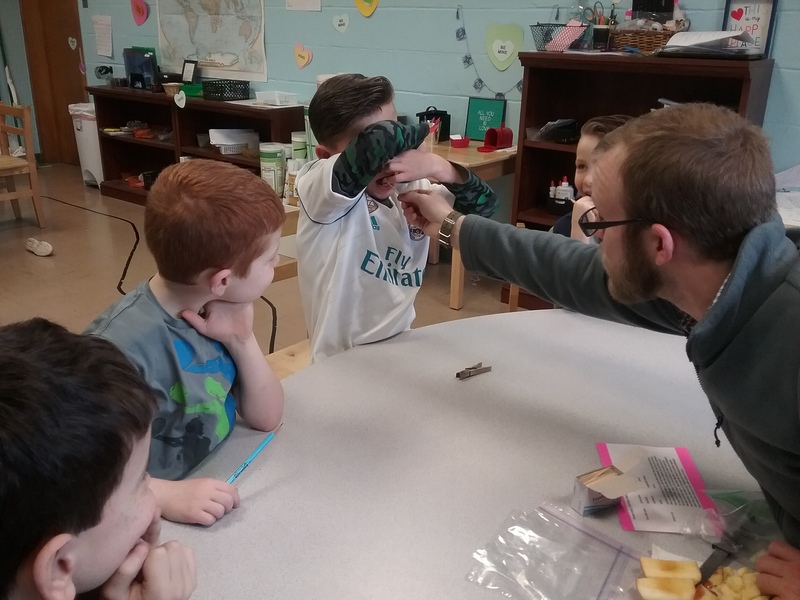 Lower Elementary students will discuss indirect objects in sentences, look at the bones in our bodies, and find plants from different continents. Fourth year students will begin their virus models and report and study the Australopithecines. All students will continue their research for the Science Fair. Look for an email about the supplies your child will need! Thursday, February 22 – Please make sure your student brings their recorder for Music class. If you had one ordered, they are already in! Posted on February 9, 2018 at 2:53 pm. There was a lot of Monday morning excitement with the Super Bowl Sunday night. 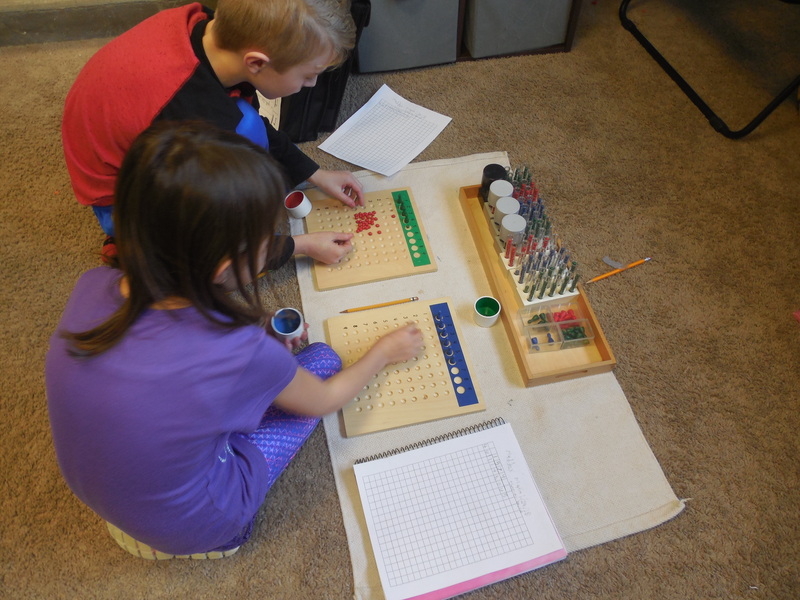 This week we practiced division with the Stamp Game, the laser tag at home game and the Flat Golden Bead Frame. We found the relationship between fractions and the months of the year. 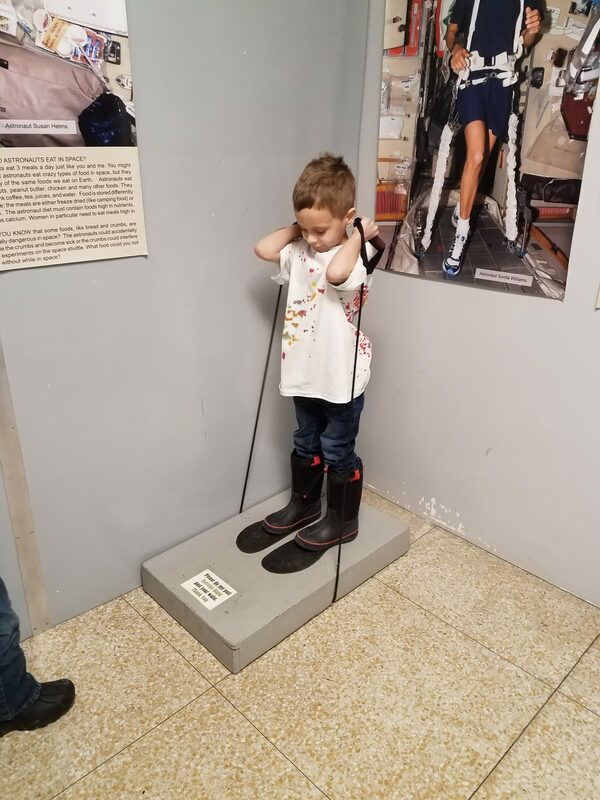 Our students loved to play with the laser tag game, this is a game that we always recommend parents at home, it is essential for kids to move around and waste their energy, specially now that technology is taking over their lives. These first year students are working together to review division with the Stamp Game. This is a lesson they were introduced to in kindergarten, but continue working towards mastery throughout the first grade year. 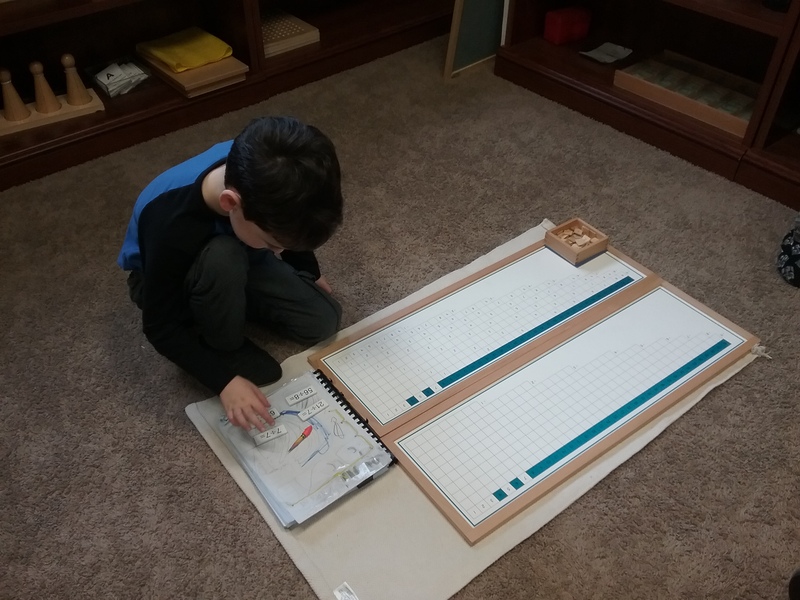 This material allows students to gain a deeper understanding of how to find a quotient before they are ready to do the work on paper. 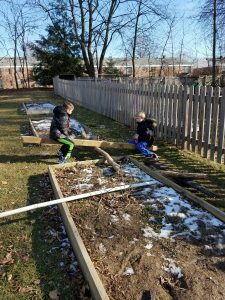 Dr. Montessori believed students should have a chance to encounter nature in all kinds of weather. 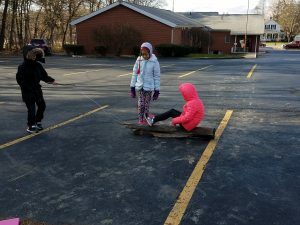 Montessori believed there were social, emotional, and physical benefits to having recess no matter the temperature or condition (within reason). When the playground is too muddy for a game of soccer to be successful, students find interesting ways to entertain themselves. 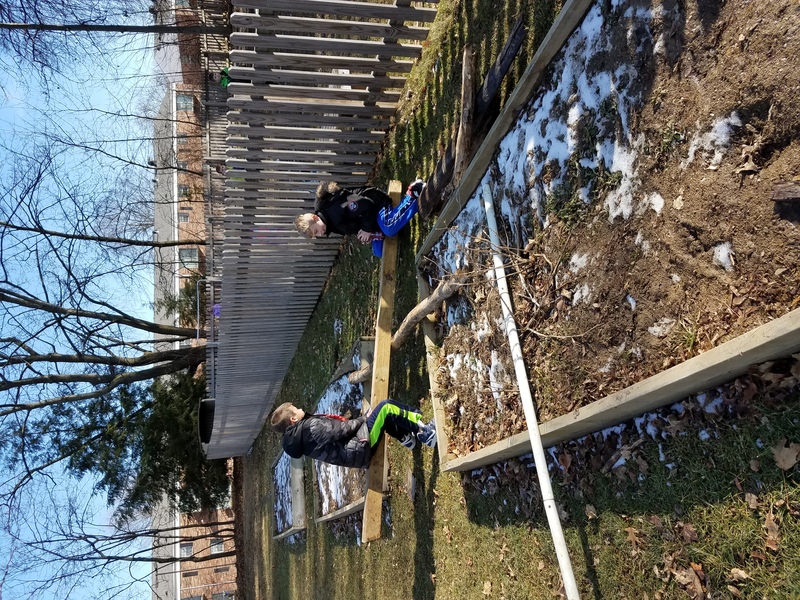 One of our third year students used some logs and branches he found around the school to build a seesaw. One of our second year students helped him test it out until they found the proper place for the fulcrum. 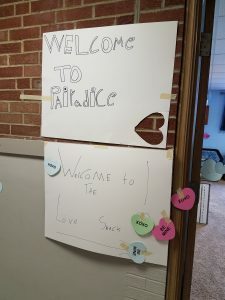 Our students are excited for the School Dance “Fun”raiser this weekend! 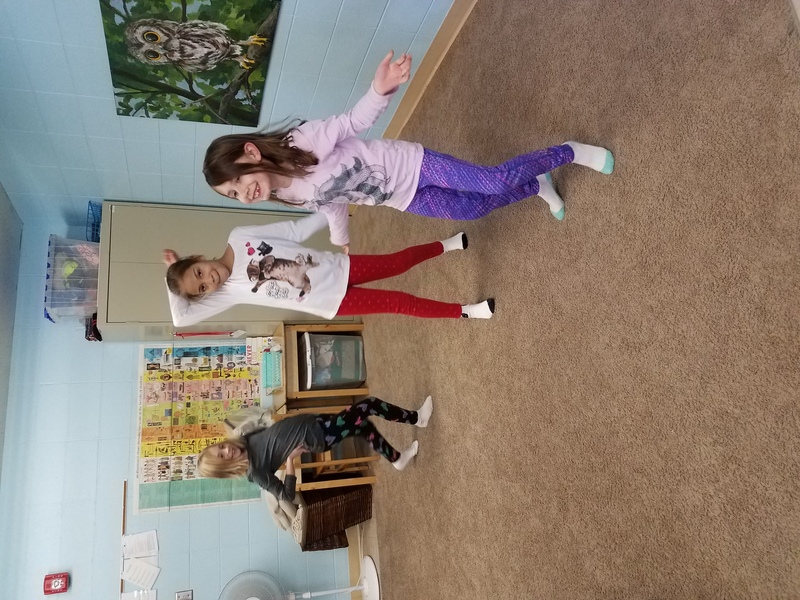 During indoor recess this week, we practiced different line dances to prepare ourselves for this Saturday. 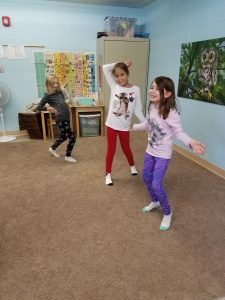 We practiced the Macarena, the Cha Cha Slide, the Electric Slide, and our own dance moves! Next week we are excited to continue our Science Fair work. 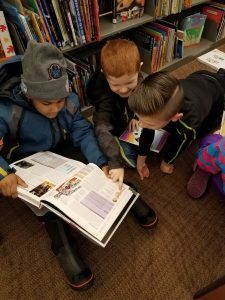 We will be traveling to the library Monday to collect books. Please make sure your child is dressed for a 15-20 minute walk there and back! 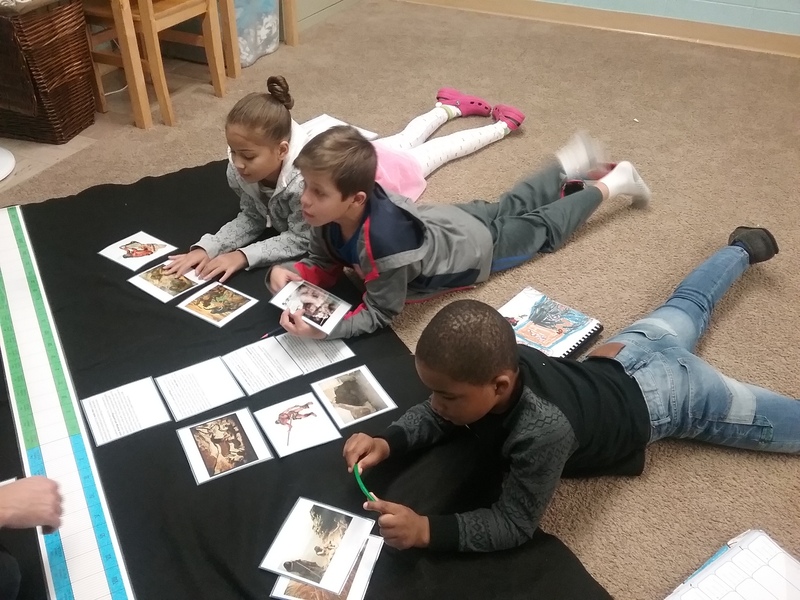 Lower Elementary students will make pictographs, discuss the origins of the days of the week, continue studying the Pythagorean Theorem, and begin our Africa Continent Study. 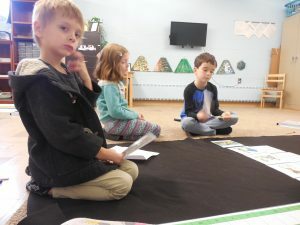 Upper Elementary students will review Early Humans Vocabulary, learn about Portmanteaus, and begin the study of viruses! 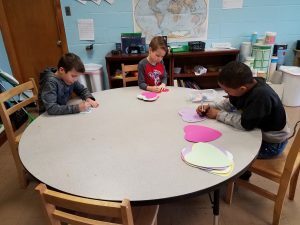 Wednesday, February 14 – Valentine’s Day Party. Please make sure all the supplies you signed up to bring are sent to school by Tuesday, February 13! Posted on February 2, 2018 at 6:06 pm. Throughout the week it was exsiting and interesting. We did a lot of things. We did knew science experiments. It was lots of fun. This is the blog. This student is getting a lesson on Metric Measurement. 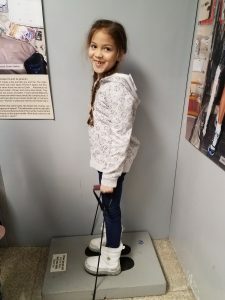 She is also learning measerments smaller than a meter. This student is a 3rd grader. He is doing the cheackerboard. This student is a third year. She is doing the microscope. She is looking at the fingerprints of are classroom. These students are doing the racks and tubes. It is divison they are doing. Next week, first grade students will review division with the Stamp Game, will discuss two straight lines on the same plane, and will learn the external characteristics of nematodes. Second year students will look at multiples and factors, will continue to review angles on a transversal, and will discuss landforms made of rocks, both natural and manmade. Third year students will practice multiplication on the Flat Golden Bead Frame, will review the rules of the apostrophe, and will discover the main characteristics of annelids. All Lower Elementary students will talk about the year and its parts and will begin the Africa Continent Study. Fourth year students determine relationships between primates, will bisect the height of triangles to find the area, and will begin studying viruses. 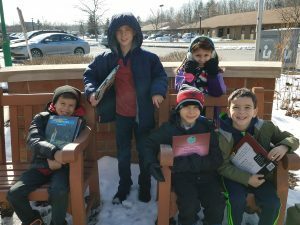 Greater Cleveland Aquarium “Going Out Experience” permission slips are due Monday, February 5. If your child would like to attend, the slip must be turned in on time in order to reserve our spot. We need your help to make our Valentine’s Day party a success. Please take some time to review our list of supplies and sign up if you can bring something! Our list can be found here. Posted on January 25, 2018 at 7:39 pm. Finally, our first full week of 2018! 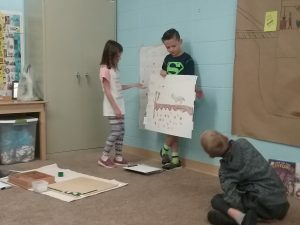 The first year students have enjoyed reviewing measuring, practicing their facts with the Multiplication Snake Game, learning the use of a direct object, and mapping a farm! Second year students have worked to read decimal numbers into the millionths, have read the origins of the names of the months, and have been introduced to pictographs. Third year students were so excited to learn how to do long division with the Racks and Tubes AND on paper! Fourth year students discovered how cells react to solutions, found the differences in cerebral cortex size among primates, and wrote paragraphs using hyphens. Together, we are all researching Europe, including a 14-Point Study of countries chosen by each group. Look for this research to be displayed mid-February! This student is writing her final draft of the letter you received about our upcoming “Going Out Experience.” In order to plan this trip, our two students in charge had to submit a proposal that answered questions about location, price, directions, and reason for attending. 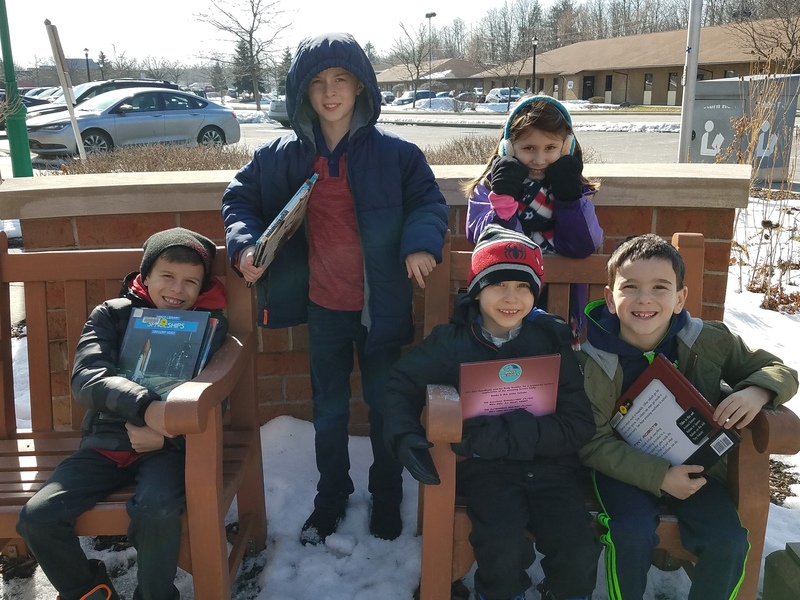 After their proposal was accepted, they had to call the Greater Cleveland Aquarium and speak with the field trip coordinator to make all the plans. After the phone call, they met with Ms. Kelly to make sure they had the information needed for the permission slips. Finally, they edited their original letter to parents and made a final copy! This fourth year student is labeling the parts of a plant cell. He has already worked with materials to learn that cells are the building blocks of life, the parts of a cell and their function, and how cells react to certain solutions. 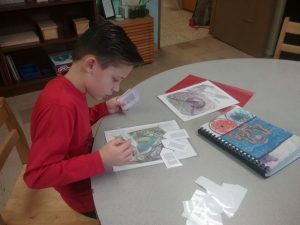 All of these lessons will lead up to a home assignment to build a model of his own plant or animal cell to share his knowledge with the class! Our second and third year students studied the origins of the names of the months. 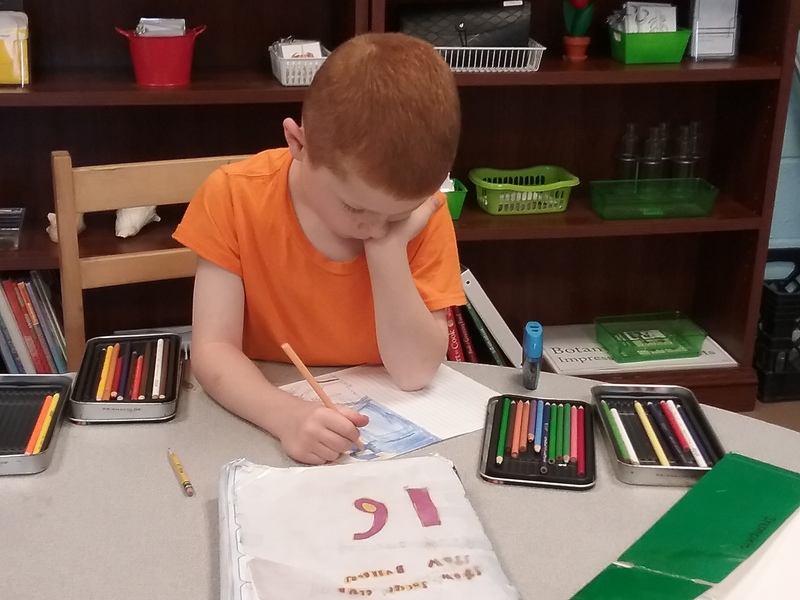 This student chose to learn about July. 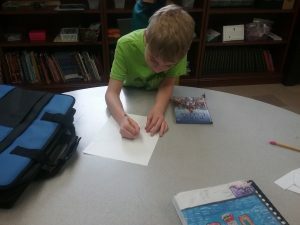 He found out it was named after Julius Caesar and is creating a drawing of him to display near our classroom calendar. For Writer’s Workshop this week, we talked about “Persuasive Paragraphs.” We first defined persuasive, then talked about times we might try to be persuasive. Negotiating bedtime seemed to be a common occurrence! After our discussion, we settled on the topic of “Follow-Up Work.” We listed reasons to have it and reasons to get rid of it. Then we took a blind vote to decide which students would argue which side in their paragraph. After splitting into our pro and con teams, the groups worked together to write their persuasive paragraphs. They will be shared after gym Friday! Next week, Lower Elementary students will practice using currency to build quantities, will continue measurement lessons, will add and subtract time in word problems, and will create family timelines! Fourth year students will create a geometric decanomial, classify early humans, discuss forces of nature in the universe, and continue working on research skills. In your email, you have received a “Going Out Experience” permission slip. This is an optional field trip for Elementary students. If your child would like to attend, please turn this in by Monday, February 5th. 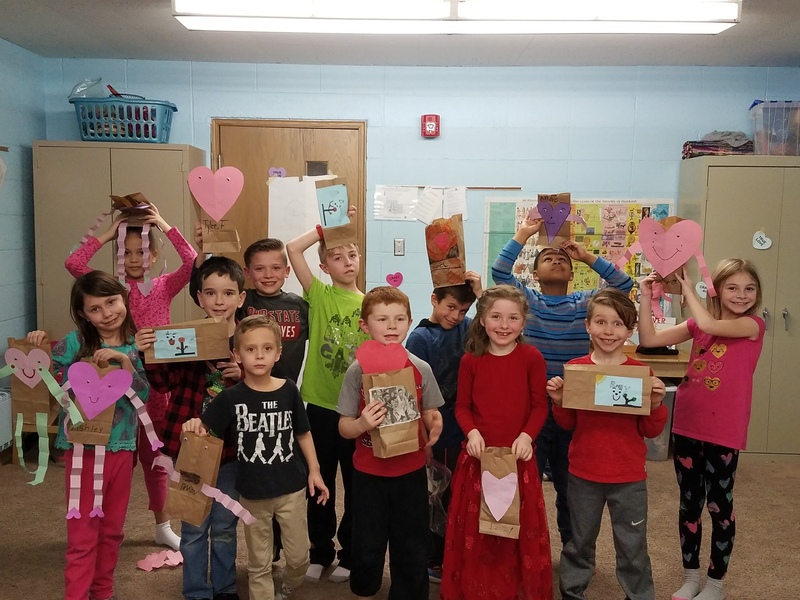 Mother-Son/Father-Daughter Dance invitations and tickets were sent home this Monday in your child’s Spelling folder. If you are planning to attend, please remember to turn the ticket into the office dropbox! TKD Session begins Monday, January 29! Posted on January 18, 2018 at 11:08 pm. This week the Elementary students had an exciting field trip and jumped right back into working. The cold weather definitely can’t stop us! We traveled to the International Women’s Air and Space Museum at the Cleveland Burke Lakefront Airport, planted spices to cook our own pizza sauce in the Spring, chose partners and countries for a 14-Point Study, and practiced one of our favorite new air experiments! Our trip to the International Women’s Air and Space Museum was such a blast. Students learned about women in aviation and space exploration. Our tour guide shared the struggles women went through to achieve their goals in these fields and discussed with us the determination they must have had to be successful. 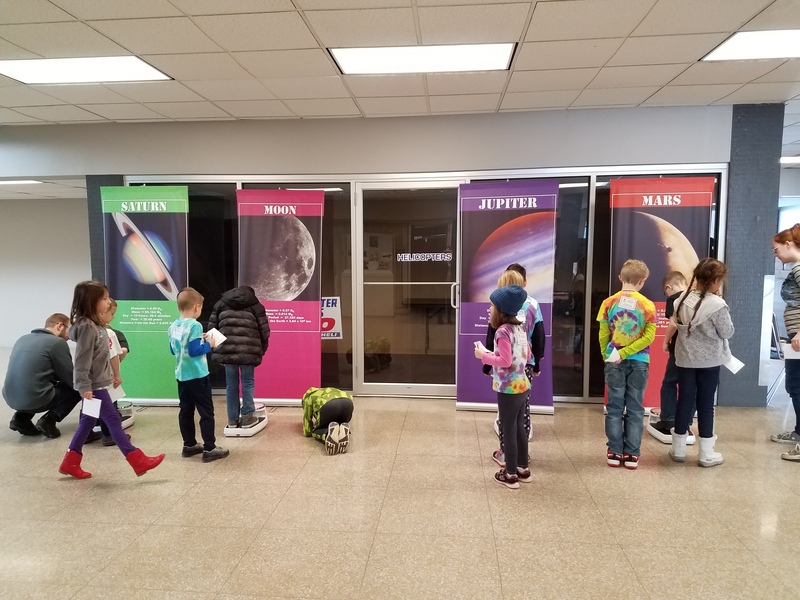 At the end of our field trip, students used different scales to see how their weight would differ on Saturn, the moon, Jupiter, and Mars. We will be graphing our findings next week! 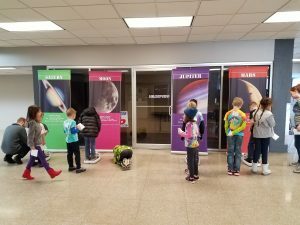 These students are inside a space station exhibit. Each day astronauts in the space station have to exercise for two hours! 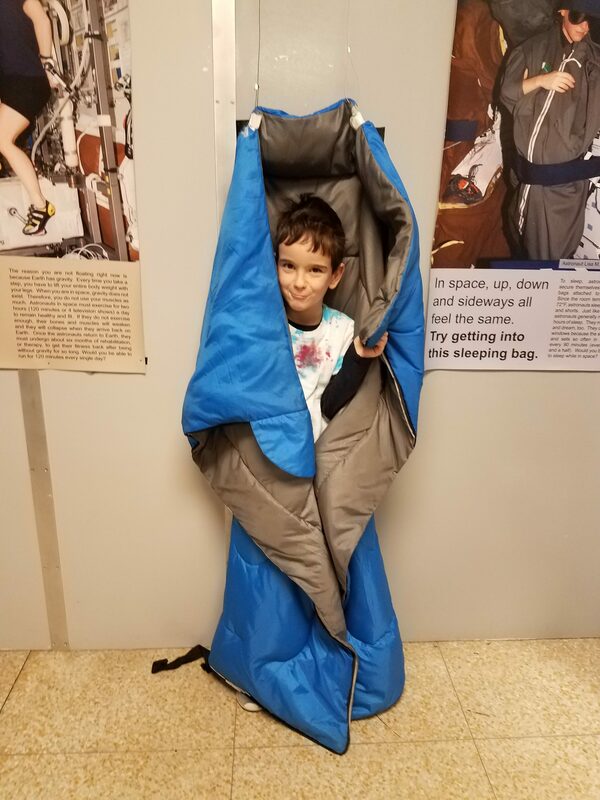 Their equipment needs to be attached to the space station and the astronaut must be hooked into the exercise equipment because of the change in gravity. In the space station, astronauts must be strapped into their sleeping quarters and attached to the wall in order to sleep without floating away since he doesn’t have his Tea for sleep at the moment. This student thought he also looked like Batman! 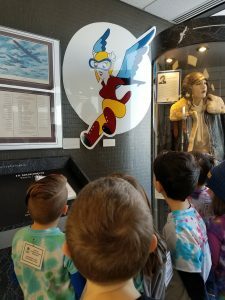 While on our trip, we learned about the female pilots during World War II, the WASPs. Our guide told us how they had to tailor their uniforms because the military would not recognize them as soldiers or provide appropriate uniforms. Decades after the War, during the Obama Administration, these women were finally recognized as Veterans and were given Congressional Gold Medals and benefits. This month we are focusing on experiments related to air. 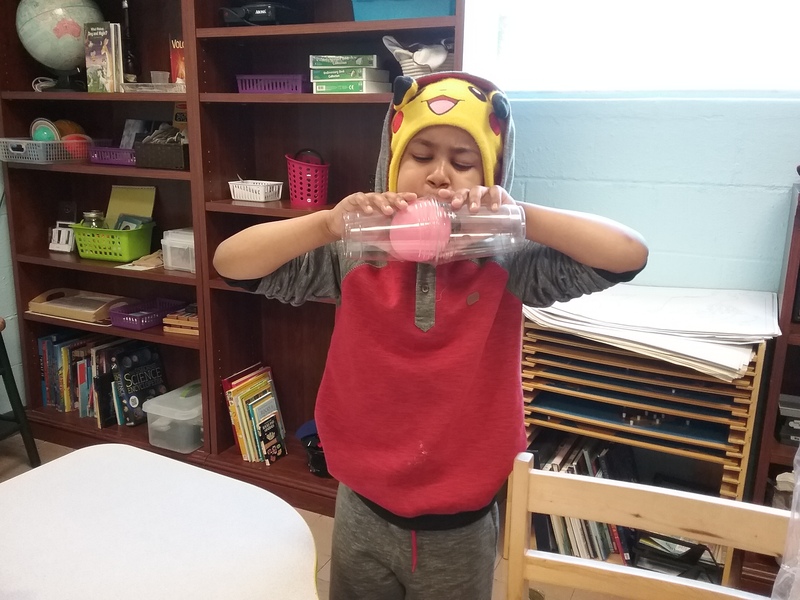 This experiment has been a favorite so far, “An Air Pressure Effect.” Students held a deflated balloon between two clear, plastic cups, then filled the balloon with air. Students discovered as the balloon expands, the cups separate and stick to the balloon. They saw part of the balloon in each cup. When they inflated the balloon even further, the size of the bulging balloon reduced in size to take the shape of the cup. 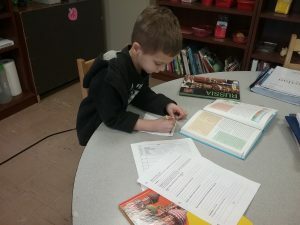 This first grade student is working on a Reading Group assignment. 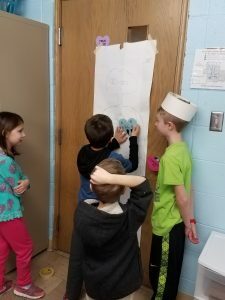 His group is finishing up the book, “Strega Nona.” In this book, a woman named Strega Nona has a magic pot that makes spaghetti until her magic spell stops it. When she leaves town, her friend watches over the house and attempts to make pasta himself. He does not know the entire spell and can’t make the pot stop. The entire town is taken over by pasta! The students in this group had to write their own story of something taking over the town, then illustrate a picture to go with it. We had ideas of water, slime, and lava! The third year students are very interested in plants this year. 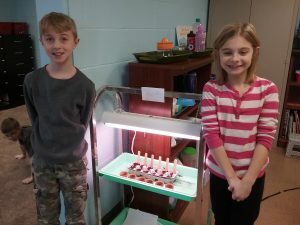 They are already growing lima beans under our growing lamp. Now, they have planted the spices needed to cook our own pizza sauce! When our plants grow, we will be baking a pizza using our own ingredients! The Lower Elementary students will be continuing their practice with Racks and Tubes, building a snake for a multiplication game, discussing direct objects, and reading food labels. Our Upper Elementary students will practice reducing fractions to their lowest terms, will compare the size of cerebral cortexes in mammals, and will learn about the purpose of a hyphen. We are collecting food labels for a project. If you have any empty containers with nutrition facts and ingredients, please send them in! Posted on January 12, 2018 at 2:43 am. Welcome back, everyone! We were so happy to finally have (almost) an entire week together! 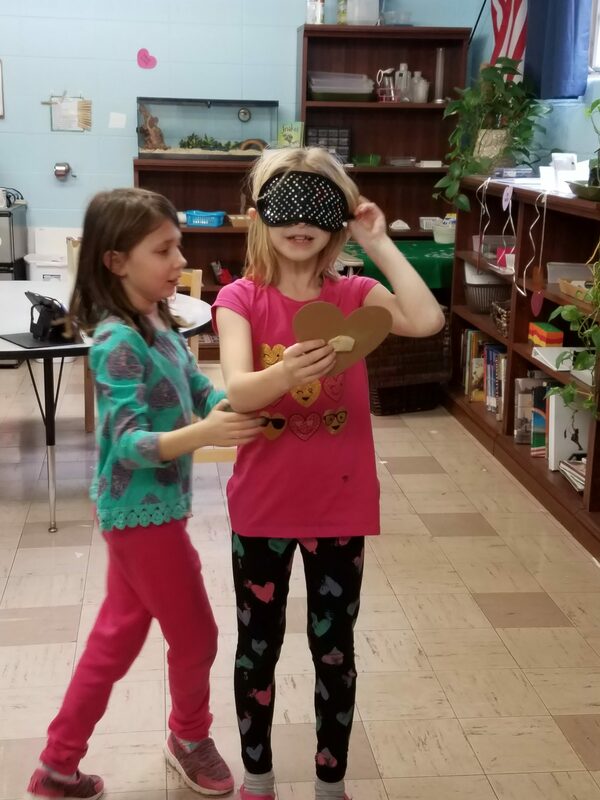 Students greeted each other Tuesday with huge hugs and their exaggerated estimates about how long it had been since they’ve seen one another. It is so wonderful to see their friendships this far into the year. These short weeks since the Christmas Show have been full of exciting student-led projects and group work! Below you can see what we’ve been up to! These students enjoyed our time in the snow by building a snowman. The middle layer was too heavy for them to lift so they used two branches to create a lever to lift it. Watching their determination while failing the first few tries and their excitement when their hard work paid off was so wonderful! 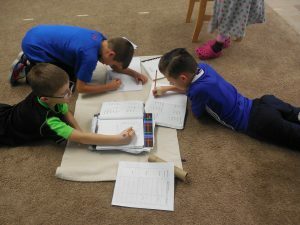 Elementary-aged students are at a stage where they test the boundaries of rules and routines to find out what is socially acceptable. 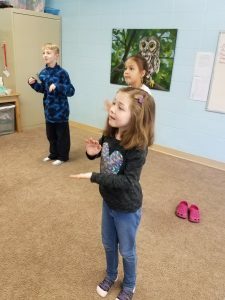 To help them gain the skills they need to be successful adults, we often structure activities for students to work with a variety of students and to explore their interests. 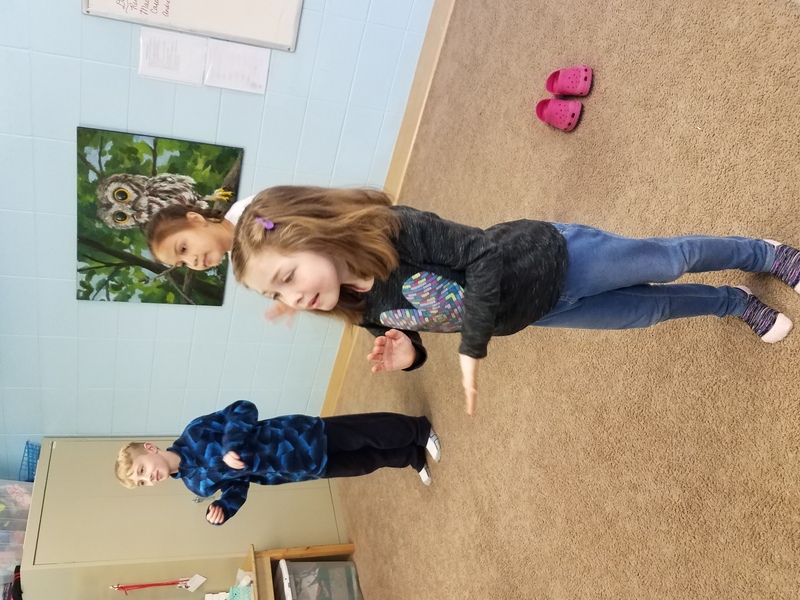 These students are participating in a lesson on Miming. 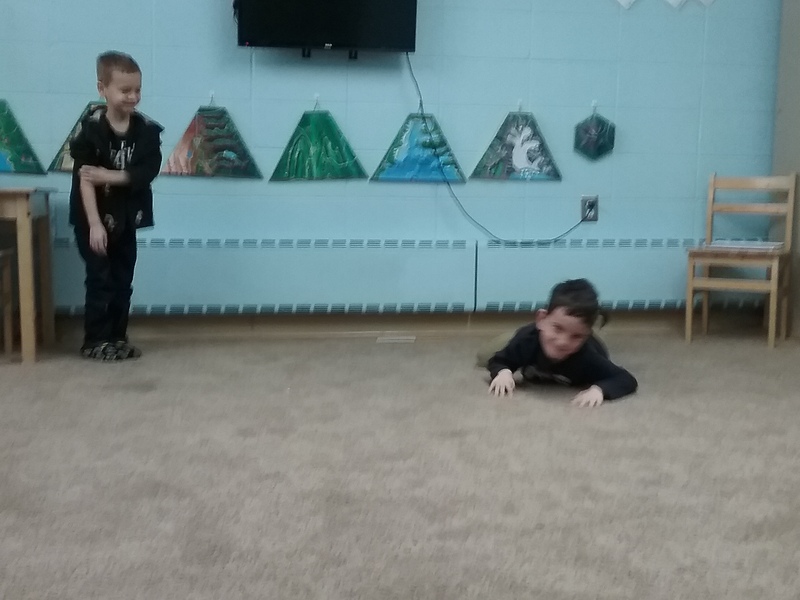 They are pretending to be a venomous snake and a person trying to escape without being bitten. After acting, the audience of their peers had to guess what they were doing. 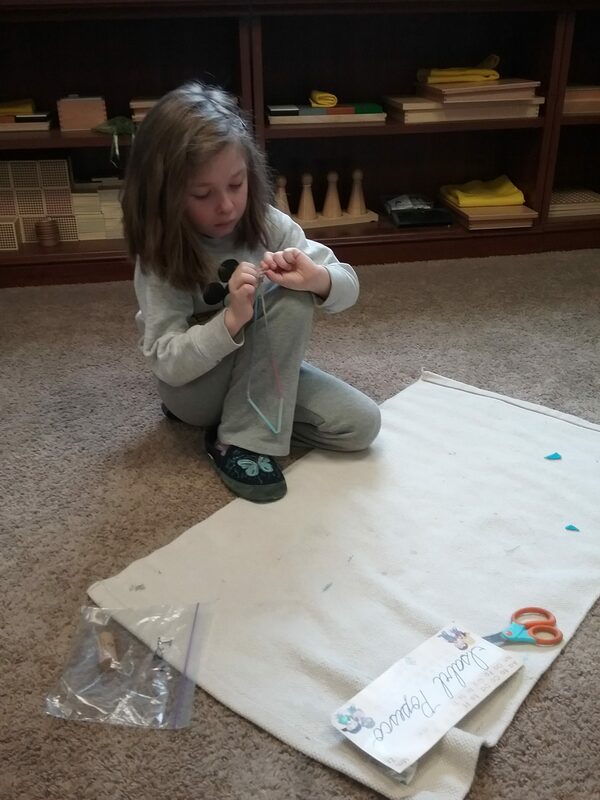 This first year student is working with our new sewing lessons. 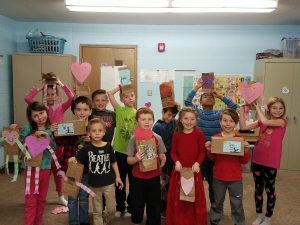 Students can choose from making a necklace with yarn and straws, practicing threading a needle and tying knots, and sewing a button onto felt to make a bracelet. Sewing lessons give students real-life skills and improve hand-eye coordination. This third year student used our molecule kit to build a model of a caffeine molecule. This material exposes students to how and what their surroundings are made of. They enjoy recognizing elements they previously studied from the Periodic Table. 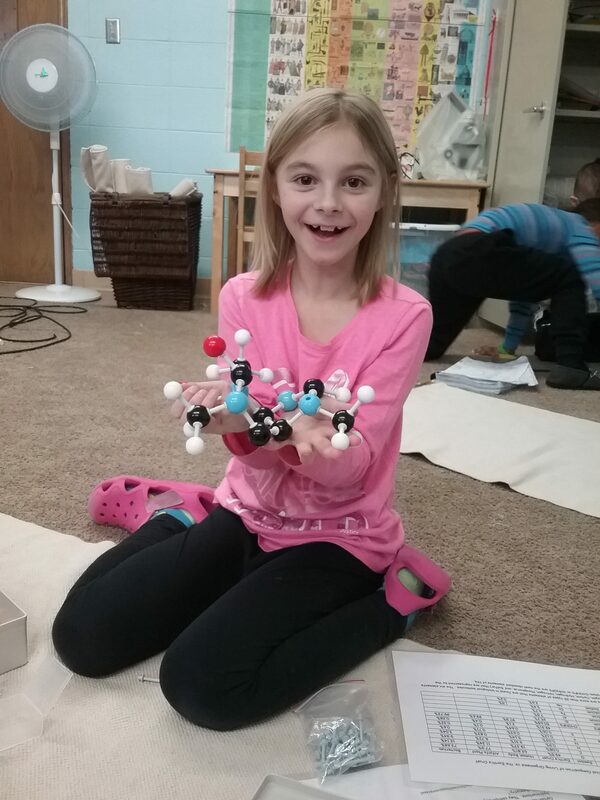 This student later built water molecules and put her models together to “make coffee.” She even put it in a mug! Never a dull moment. Next week Lower Elementary students will work with the Bohr Diagram, study parts of a stem, and research countries from Europe. 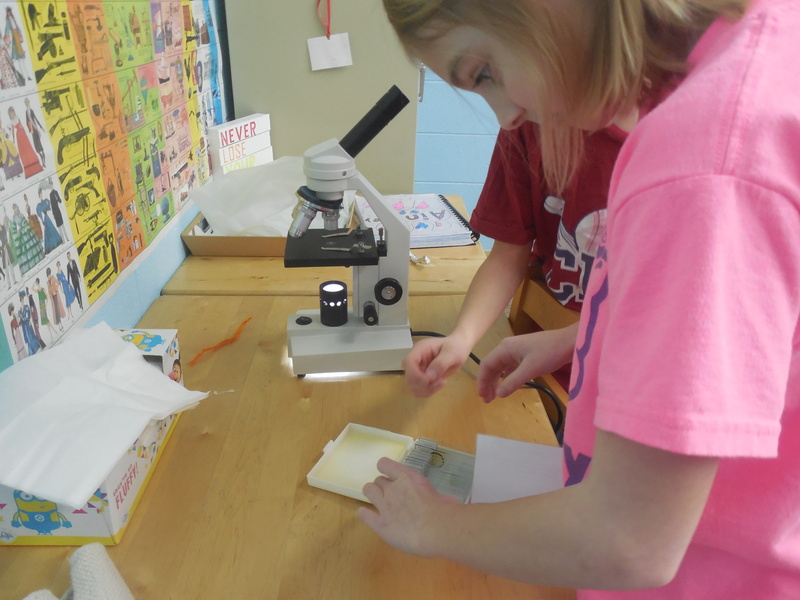 Upper Elementary students will compare plant and animal cells and review lab safety rules before studying solutions. No School Monday, January 15, in observance of Martin Luther King, Jr. Day. Tuesday, January 16 – International Women’s Air and Space Museum Field Trip. We will head to the museum, by bus, at 9 am and will return to the school for lunch by 12:30. Please remember to have your child wear their tie dye shirt! Wednesday, January 17 at 6:30 pm – Kindergarten Parent Meeting at the Tallmadge Campus. Childcare is provided. Posted on December 15, 2017 at 2:16 pm. What a busy week we have had! The students are very excited to share their bucket drumming, bell ringing, and surprise performance tonight at our Christmas Show. While students are not on the stage for a long time, they spend a long time organizing, practicing, and making changes in preparation for the show. 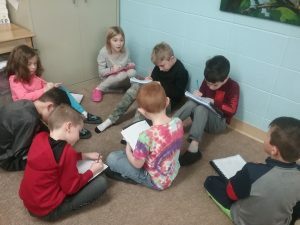 Students write and memorize lines for song and performance introductions and are role models while practicing with Ms. Courtney’s class. This year we even have a couple Elementary students helping Ms. Courtney’s class with one of their song performances. While we were preparing for the show, we had quite a few exciting lessons. 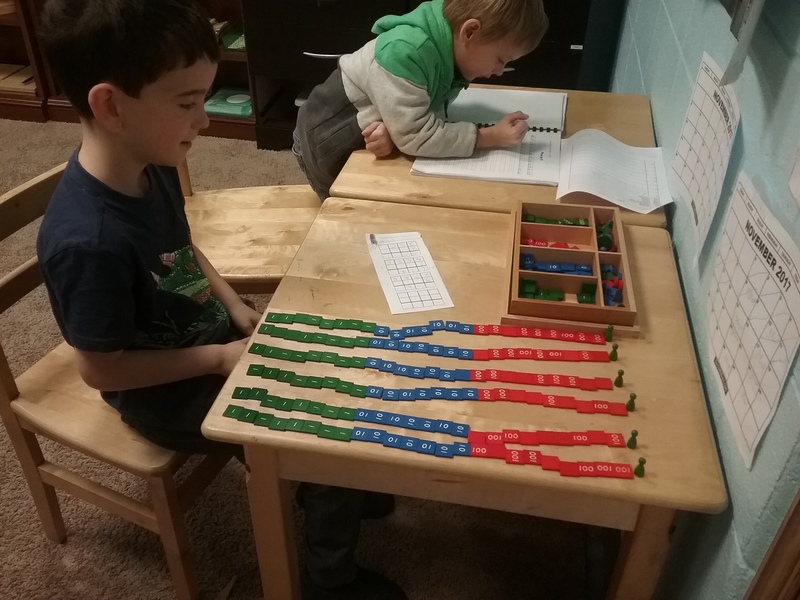 First years were excited to learn how to find the multiples of numbers using the bead bars, have their first lesson on sentence diagramming with Sentence Analysis, and found different types of lines throughout our classroom. Second year students began subtracting fractions with like denominators and looked at the differences between dehiscent and indehiscent fruits. Third year students continued their human body research with heart and lung experiments and began their divisibility study with the discovery of numbers divisible by 2. Fourth year students found the prime factors of numbers, learned growth and reproductive information about cells, and charted their discoveries about the differences and similarities of the five kingdoms. This fourth year student is finding the prime factors of 56. 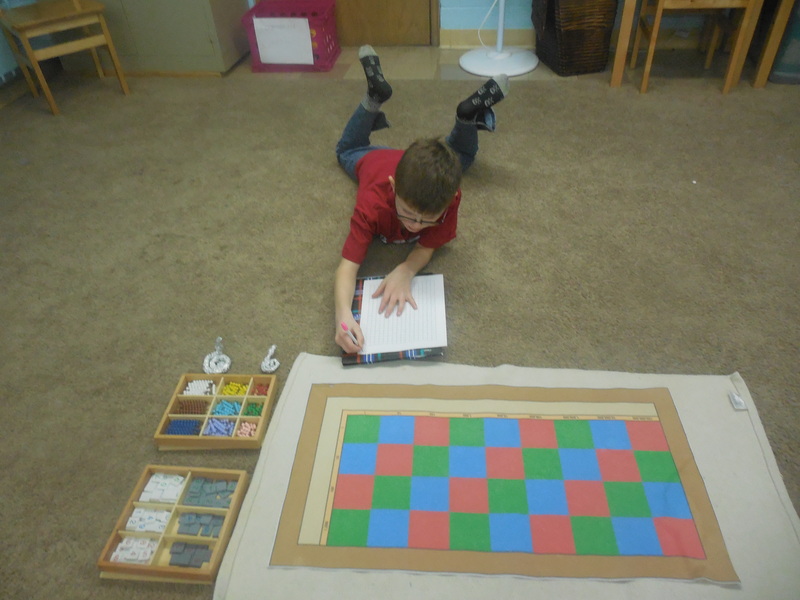 With a white strip to divide the peg board, he is able to find the factors using his knowledge of division facts. 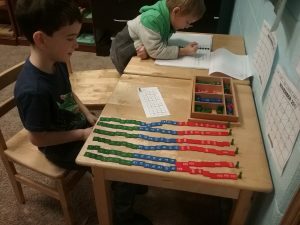 He builds the number 56 in pegs (blue pegs representing the tens’ place and green representing units), then beginning with the smallest prime number he divides. He places his answer to that equation back on the left side of the white strip, then continues the process. He knows he is finished when his quotient is one and can check his work by multiplying all of the prime factors together. 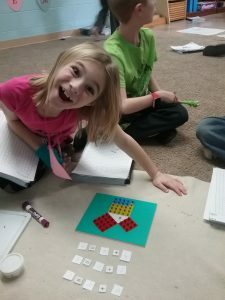 This work helps students with quickly reducing fractions, especially with unlike denominators. Each week, the Elementary students have a new science lesson. After the lesson, they repeat the experiment and complete a lab report explaining the process. This student is doing our “Holding On” experiment. This experiment has students use a suction cup to try to lift different rocks. 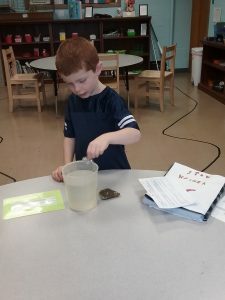 Students found that adding water to the suction cup, or fully immersing the rock in water, led to more positive results. Students discuss their ideas about why this works before consulting the explanation on their experiment card. 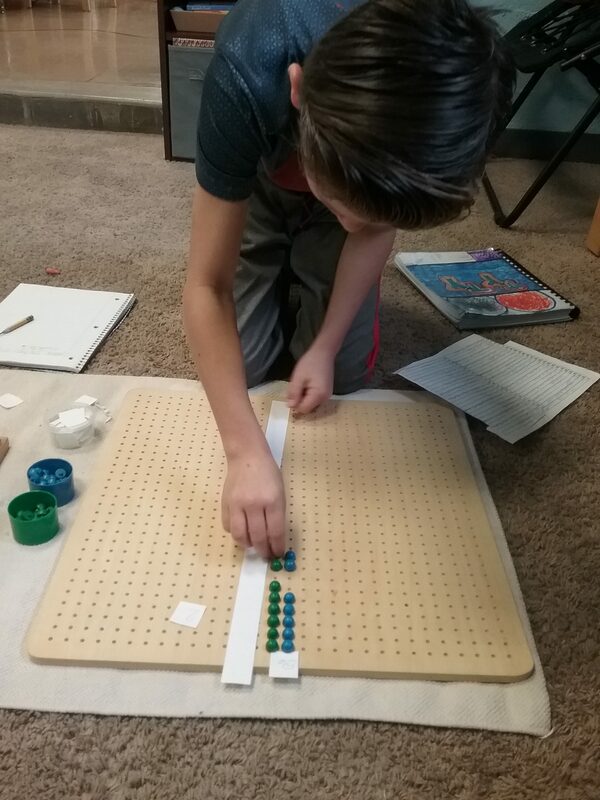 This student is practicing his multiplication facts with our bead bars. He is finding the multiples of 7. During this work, the child forms the equation horizontally with the beads, then places the product of the equation vertically underneath before recording the multiplicand, multiplier, and product. Typically students practice the facts from 7 x 1 up to 7 x 10, but this student has been working for a few days and is up to 7 x 21! We enjoy seeing students taking their interests above and beyond! This first year student is working with our Sentence Analysis material. This material helps students deconstruct sentences to learn what each word does or means. The first lesson students receive is just a look at the action (predicate) of a sentence and who/what is doing that action (subject). 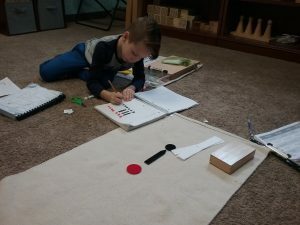 Students are able to quickly find the action from their practice in kindergarten with the red grammar symbol representing the verb. The arrow in the lesson shows what word is receiving the “energy” from the action. 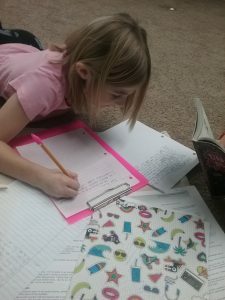 Sentence Analysis helps students become stronger writers and can even help with learning another language! This week we only have three days of school! Monday all students will have their midyear Spelling Assessment so there will be no homework. 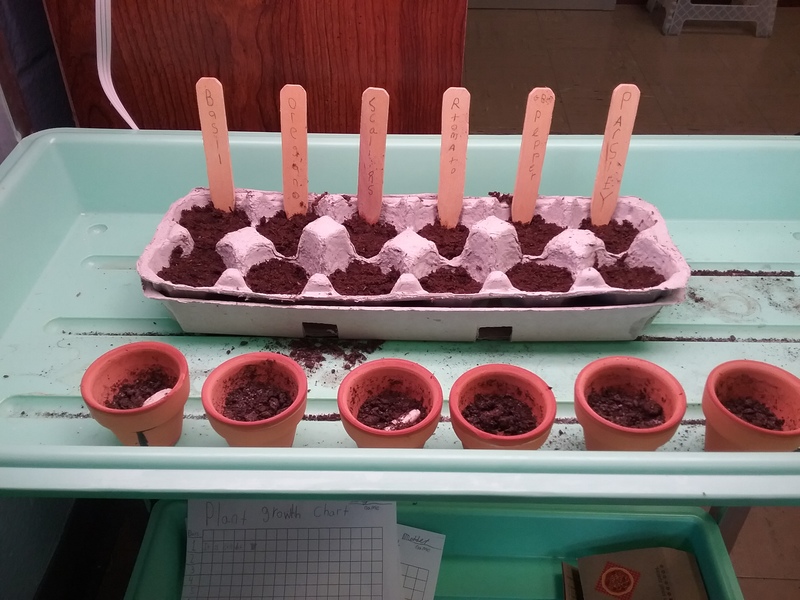 First year students will conduct root experiments and continue their planet research. 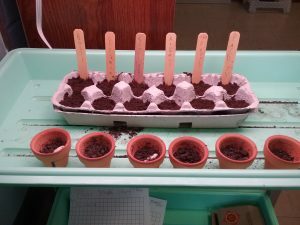 Second year students will try a seed experiment that involves not speaking for an entire 30 minutes! Third year students will calculate distances between objects on a map and look at the positions of flower ovaries. Fourth year students will continue their study of cells. Wednesday, December 20 – Pajama Day: Students may wear pajamas and bring a pillow and blanket/sleeping bag to enjoy “The Polar Express.” Students may also bring a board game to play and an item for Show-and-Tell. We will be sharing our Christmas Compliments with each other, making bouncy balls, enjoying some hot cocoa, and making ice cream with Ms. Courtney’s class. Elementary students WILL need a lunch this day. There is no school Thursday, December 21, through Tuesday, Jan 2. School resumes Wednesday, January 3. Happy Holidays! This week students have worked on many exciting lessons! 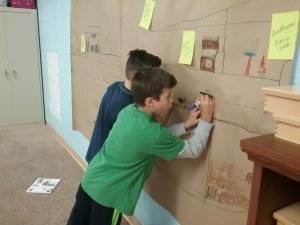 First year students worked on Stamp Game Multiplication, learned about positions of a straight line, discussed the external characteristics of a protozoan and looked at the needs of humans during the Middle Ages. The second year students were excited for their first lesson with the Racks and Tubes. They also looked at life during the Middle Ages, the relationship between two angles and different types of rocks. Third year students took their microscope test, practiced multiplying with zero in the multiplier, looked at the least common multiple of three numbers, and discussed the main characteristics of platyhelminthes. Fourth year students added fractions with unlike denominators, looked at additional characteristics between primates, apes, and humans, and reviewed the five kingdoms of living things. 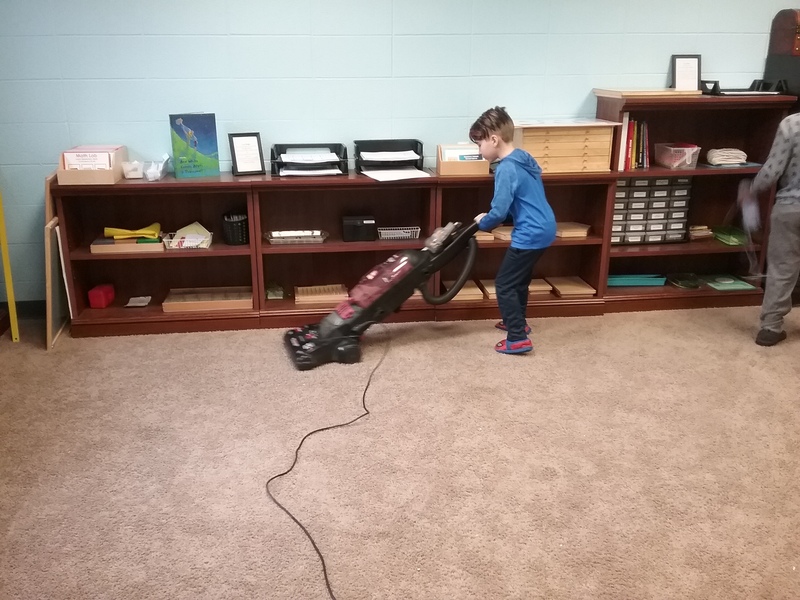 In the Montessori classroom, you will often see students doing chores throughout and at the end of the day. 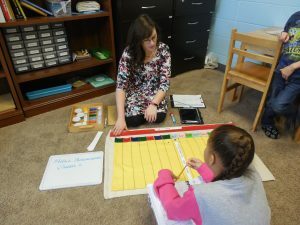 This not only helps prepare them for adulthood, but also helps them take ownership of the condition of their classroom. 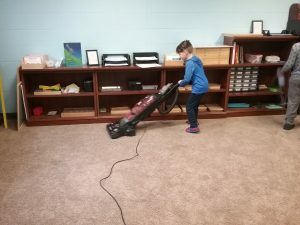 When students feel a personal responsibility for their classroom, they are more respectful of the materials and each other. Second and third year students are interviewing older relatives to learn about their family history. This third year student has completed her interview and is taking her draft through the writing process. Students use a red pen or pencil to add more interesting details, then a blue pen or pencil to make punctuation and spelling changes. 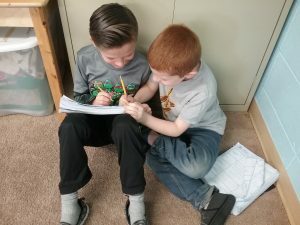 After all of the editing is completed, the students write a final draft. 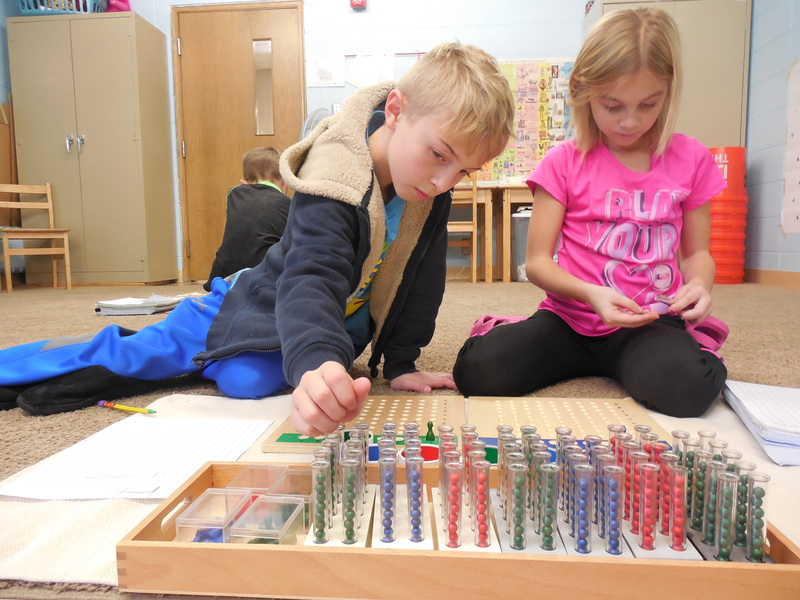 This student is working with the Division Charts. These charts help students memorize their division facts in preparation for more challenging work and division on paper. Next week Lower Elementary students will look into the origin of their names, practice sentence analysis, discuss different types of roots and seeds, and will learn about friction. 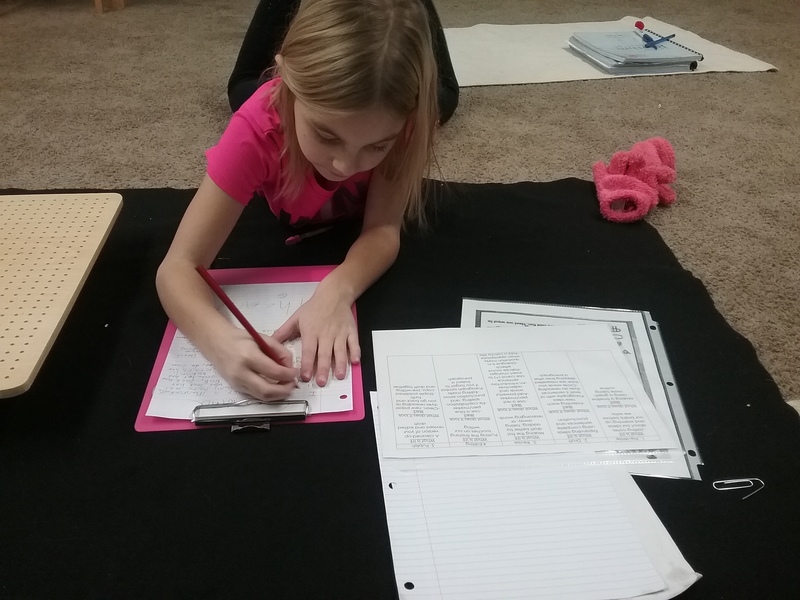 Upper Elementary students will work on prime factors, discuss cells and energy, and will continue to compare primates, apes, and humans. Wednesday, December 13, Christmas Show Rehearsal, from 6:00-7:00. Elementary drop off is inside of the auditorium in the front two rows on the right side if you are facing the stage (same as last year if you are a returning family). Please make sure you take your child to the bathroom BEFORE dropping them off with us. Friday, December 15, Christmas Show. Students must arrive by 5:30. I will have the costumes for each student, so please be prompt so they can change in time. Please make sure you take your child to the bathroom BEFORE dropping them off with us. Remember to dress your students for the cold weather. We will be going out until it drops below 25 degrees, including in the snow. 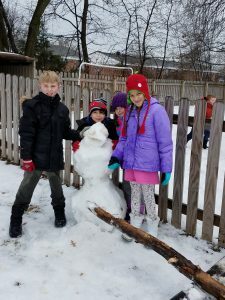 Students should have a winter coat, a hat, gloves/mittens, and snow boots and snow pants for snowy days. Posted on November 30, 2017 at 8:32 pm. This week we’re busy. The first grade worked on fundamental needs and started planit research. The second worked on Rock testing. Third worked on Parts of Microscope. Fourth worked on Cross Multiplication. 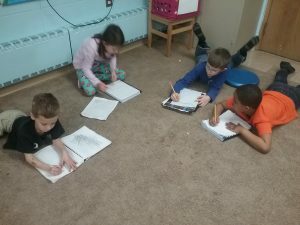 These boys are working on Spelling. It is important to get your follow up done. We are doing Racks and Toobs. It helps you learn divishun. 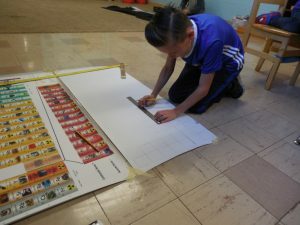 This student is drawing the Periodic Table. He will use elements on the Bohr Diagram. Theas first graders ar doing Fundamental Needs. Thay ar learning about Greeks. Next week we will continue our bucket drumming, bell ringing, and secret surprise practice! First years will work on Stamp Game Multiplication, learning different types of lines, discussing protozoans, and discovering types of food chains throughout different ecosystems. Second year students will begin using the Racks and Tubes, learn about their family’s history, and discover the relationships between two angles. Third year students will multiply with zero in the multiplier, find the least common multiple of numbers, and take their microscope test. Fourth year students will discuss characteristics of different mammals, write sentences with different adverbials, and compare the living things in the five kingdoms. REMINDERS: An email was sent out about costumes for the Christmas Show. Please make sure you respond to the email by December 8 if we need to order ALL of your supplies. If you are buying your own pants and shirt, please send them to school by December 8.